The early history of Jews in Kent County parallels the patterns of Jewish settlement elsewhere in the Mid-Atlantic region. The first permanent settlers came in the mid-19th century; they were peddlers, retailers, and a few were leaders in the early food canning and packing industries. The first to arrive came from Germany and by the end of the 1800's, most were coming from eastern Europe, primarily Russia. The turn of the century brought the first semblance of a Jewish community in central Delaware. By this time, there was a torah in Dover (at the Pikus residence) and the first minyans were held in houses on New and Loockerman Streets. Their numbers were bolstered by a small but growing Jewish population in Milford. The first Jewish farmers began arriving at the same time and the Jewish population in town and in the country grew steadily following World War I. By the early 1930's the Dover Jewish Community has still not officially organized. A young woman who had been instrumental in bring people together, Bessie Nurock, met an untimely death in 1932. While sitting shiva, her close female friends and family vowed to continue to promote community activities in her memory. They called themselves the Bessie Nurock Sisterhood. With the arrival of the Rudnick family to a farm south of Dover in 1936, community activity got a major boost. The Bessie Nurock group joined forces with the farm women under the leadership of Fannie Rudnick and organized the Jewish Women's Social Club. While it was officially a women's group, the husbands has been less-formally organizing for some time. Together, they arranged classes to teach children Hebrew, brought schochets in on the train and hired rabbis to lead services in rented buildings for the High Holy Days and other special occasions. 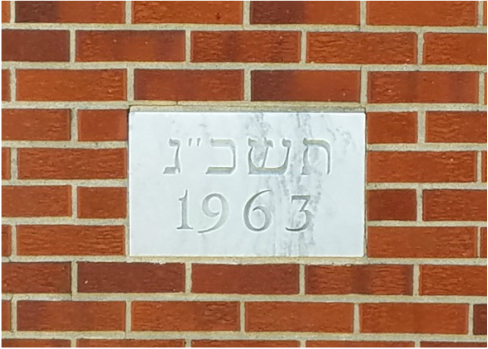 In early 1939, the Jewish Congregation of Lower Delaware was incorporated. The Dover Jewish Community seemed poised at this point to establish a synagogue and hire a rabbi, but World War II interfered. By the time the community regrouped after the war, there were a few changes. Fewer Jews were found on the farm, new industries were attracting new people to Dover and the Jewish population in town was growing. In a short time, the congregation was ready to buy land for construction of a synagogue and community building. A property was purchased in 1946 but was soon sold, purportedly because of anti-Semitic neighbors. In 1947, the men's and women's groups reorganized and formally joined forces. The congregation was known as Beth Sholom Community Center, Inc., and the women's club became the Sisterhood. In 1948, a small church (on what is now Route 8) came on the market, and $10,000 was raised for it's purchase. The building was in the new congregation's hands late in 1948, and it was renovated and formally dedicated in 1949. The Dover Jewish Community soon outgrew their small home and the present synagogue at Queen and Clara Streets was constructed in the early 1960's. At the same time, the name was changed to Congregation Beth Sholom.